Demons...brrr. 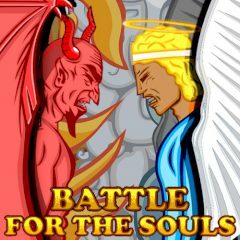 Here you are going to choose who is more stronger demons or angels? Well, definitely angels should win! You must do everything to kill all the devils and become the only one winner of the game. Are you ready for that? Your goal is to free all islands from the evil and save the soul. Draw the path to enemy or neutral island to send the angels here. Hold ctrl to command all the warriors. You can choose several your islands fro attack. Just drag the mouse over the island. Click on your island to upgrade its capacity, angels, moving speed and generation rate. But remember each upgrade will cost a few souls for your island. Several units flying together are merged into bigger one. Bigger unit kills small ones with little loss, but small units move faster.